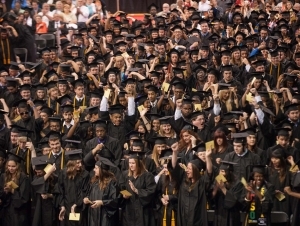 Buffalo State will confer degrees on more than 2,050 undergraduate and approximately 600 graduate students during its 142nd Commencement celebration, Saturday, May 17, in the Sports Arena. The following graduates of the Class of 2014 will be honored with the SUNY Chancellor’s Award for Student Excellence in recognition of their academic and extracurricular achievements, leadership, and service: Melissa M. Ash, Adza Beda, Anthony R. Bruno, Timea Kernacova, Jeff R. Oyo, and Eric C. Sauerzopf (undergraduate students), and Daniel E. Frontera (graduate student). Kernacova will address the audiences at the morning and afternoon ceremonies as the recipient of the President’s Medal for Outstanding Undergraduate Student. Frontera will deliver an address at the evening ceremony as the recipient of the President’s Medal for Outstanding Graduate Student. State University of New York honorary degrees will be presented to Evelyn S. Lieberman, ’66, director of communications and external affairs, Smithsonian Institution; and Arnold L. Mitchem, founder and president emeritus, Council for Opportunity in Education. Lieberman will deliver the commencement address at the morning ceremony, while Mitchem will deliver the address at the afternoon ceremony. In addition, Distinguished Alumnus Awards will be granted to Frank B. Mesiah, ’61, ’69, president, Buffalo Branch NAACP; and Valerie A. Logan, ’89, information sciences thought leader and former global vice president of strategy, Information Management and Analytics Services Division, Hewlett-Packard Company. Kimberly Evering, ’94 web communications manager, Northern Virginia Community College, will receive the Young Alumnus Achievement Award. Logan will deliver the commencement address at the evening ceremony. Former Buffalo State President Aaron Podolefsky will be honored posthumously with the President’s Distinguished Service Award. The College Council Medal will be presented to Alphonso O’Neil-White, Buffalo State College Council member emeritus.